Do not walk on the Parade Deck. The Parade Deck is sacred ground reserved for Marines. Stay on the sidewalks, keep off the grass and out of the streets. Remember, this is a working military installation. Mobility equipment is available to rent during your visit at MCRD San Diego. Equipment quantities are limited, and available on a first-come, first-served basis. Available starting at 0700 Graduation Week Thursdays and Fridays. Exclusions and conditions apply; see terms & conditions for details. All visitor vehicles MUST enter through Gate #5 (Washington Street, exit off of highway 5 north or south). How do I find my new Marine if I haven’t been able to contact him? Personal effects will be given back to new Marines on Graduation Day. If your Marine still has cellular service, try calling that number. Many new Marines will go to the “Liberty Lunch” buffet, held at the Bay View Restaurant, or will go to the mall area next to the MCX Main Store. If you’re not shy, try asking other new Marines if they have seen him. 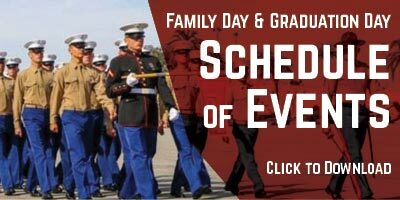 All Marines graduating that day will have served in the same company. Where to get a room on MCRD San Diego? Lodging on the depot for visitors, also known as Billeting, please call (619) 524-4401. What are the rules for law enforcement regarding brining firearms aboard the Depot? 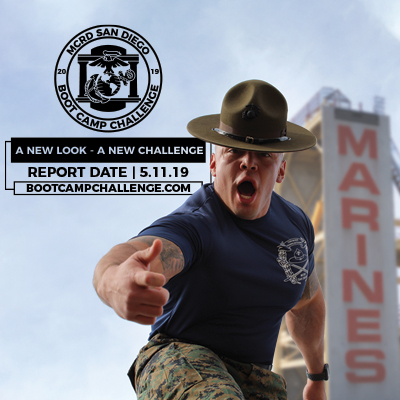 USMC MCRD Police, also known as Provost Marshal, please call (619) 524-4202. Graduation ceremonies typically end by 12:00 sharp. Exiting the Depot can take 30 minutes to an hour, depending upon attendance. Flights should be scheduled no earlier than 3:00pm to allow time to transit between the Depot and San Diego International Airport. SATO Travel arranges many of the new Marines flights home. When you book an airline reservation through SATO Travel, they can usually coordinate your air travel with your new Marines, based on the information you give them. No big rigs are allowed. You have to find your own place to park them off base. For Family Day, wear comfortable casual clothing and walking shoes. Order t-shirts at usmc-tshirts.com. 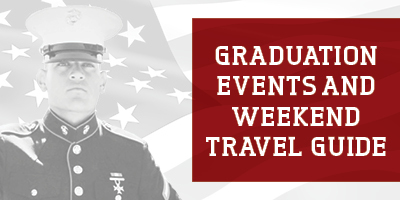 For Graduation Day, Service members are encouraged to wear their dress uniforms. Dress is business casual for all graduation ceremonies. Wear sunscreen. MCRD does not provide shuttle service to or from hotels.